This Web site was developed to educate children about the biological effects of drug abuse on the body and brain. Drugs, the Brain, and Behavior: The Pharmacology of Abuse and Dependence. [Brick, J. & Erickson, C. K.] Binghamton, NY: Haworth Press, 1998. This book presents a good overview of the brain, major classifications of drugs, how drugs work in the brain, and addiction. This Web site created for teens provides information on the science of drug abuse and addiction, including personal stories from teens and activities for students. This Web site provides science-based information about drug abuse to children. Focus on Drugs and the Brain. [Friedman, D.] Frederick, MD: Twenty-First Century Books, 1990. This book, part of the "Drug-Alert Book" series, includes a section on each drug of abuse and addiction. This series is designed to encourage students in grades 5-9 to learn about the effects of drug abuse on the brain and body. 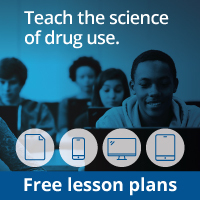 This site, developed specifically for teens, provides information on drugs.